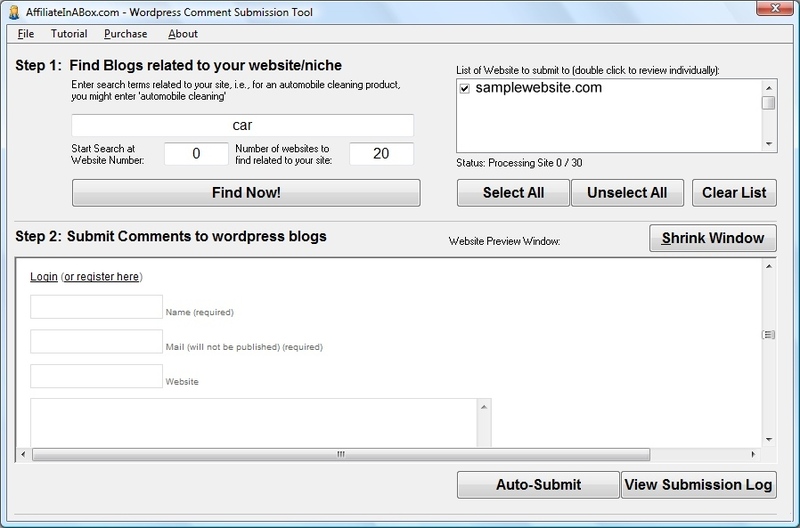 WordPress Comment Submission Software! - $29.95 U.S. If you run any kind of business, then obviously you know that it is important to get other people know about your product or service. Because if people don’t know about your product or service, then how can you connect with them, and/or make a sale? Well, this WordPress Comment Submission software allows you to do precisely that! This is a tool designed to facilate commenting on other people’s blogs, with websites that are related to yours. This is a tool that allows you to add value to someone else’s website, while at the same time, giving users to get the chance to find out what product/service you offer. If you use this tool to simply spam a message on various blogs, not only will your comments most likely be deleted by the webmasters themselves, but most likely your IP address will be banned from most WordPress blogs, and so you will not be able to get any comments on any blogs. So, please use this software intelligent (which will be described below). So how do you use this software effectively? Find blogs related to your specific niche by clicking a button! Simply type in keyword phrase that related to your product or service, and the software will use google’s search engine to find related blogs. So for example, if you were say selling a product related to automobiles, say specifically cleaning corvettes, you might simply type in the word “corvette” or “convertibles”, and then the software would find blogs related to your keyword/product/service. Automatically post to wordpress blogs! With the click of a button, you can automatically post to various wordpress blogs. Please note though, again, do not use this for spamming purposes, but rather use it for blogs related to your product/service. You can go through the websites one by one, to make sure they are actually on topic, or have the software automatically cycle through the various websites. So why not get the software today? You can download an evaluation version, which has a limited set of functionality, or get the full version which allows you to use the entire software with it’s full functionality! So try the software for free, or get it now!